We weren't expecting it. In fact all week long the weather report was calling for a 'nuisance dusting'. But they were wrong. In my town we got about 11 inches of snow! We lost power for 20 hours but it was worth it! I took a bunch of photos for future paintings. We do't get snow often so I had to take advantage! 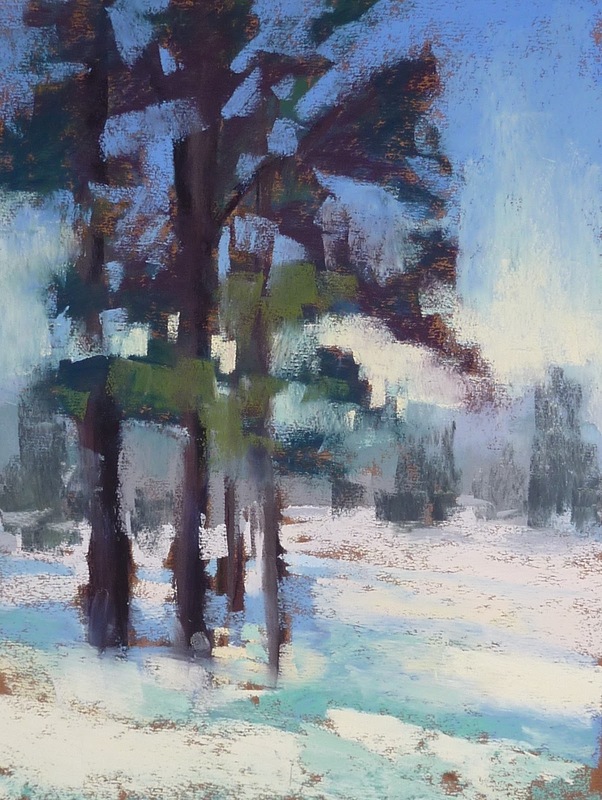 For today's post I am taking you behind the scenes of this pine tree painting. During the snowy day I pants these trees as they were getting covered on snow. The morning after the storm the sun came out and it was glorious! All of the trees were covered with snow making a true winter wonderland. 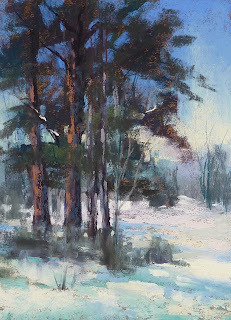 I wanted to paint the trees before the snow melted off the branches. I took out a piece of Wallis warm mist from my stash. I thought the warm brown tone would be perfect for my sunlit trees. I did a quick sketch with a piece of vine charcoal. I wanted just a loose drawing of my main shapes and lines. The next step was to block in the darkest areas of the painting which was the tree trunks and foliage (needles) I used several layers of dark value pastels......purples and cool greens and turquoise. I put in more foliage than I needed so it was time to carve into the dark shapes with my sky. I used a couple of blues and a pale yellow to paint the sky. 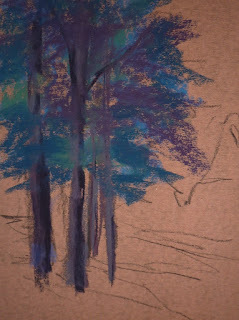 I used the darkest blue to carve the sky into the pine foliage. I also paint the distant tree line with light gray blue greens. Next came the snow I used duller warmer pinkish snow in the distance and the brightest sunlit snow in the foreground. In the next stage of the painting it was time to start adding detail. I add branches in the trees and scrubby bushes at the base of the trees. I also add detail to the tree trunks. I layered several colors in the trunks from violet to orange to get the sunlit glow. 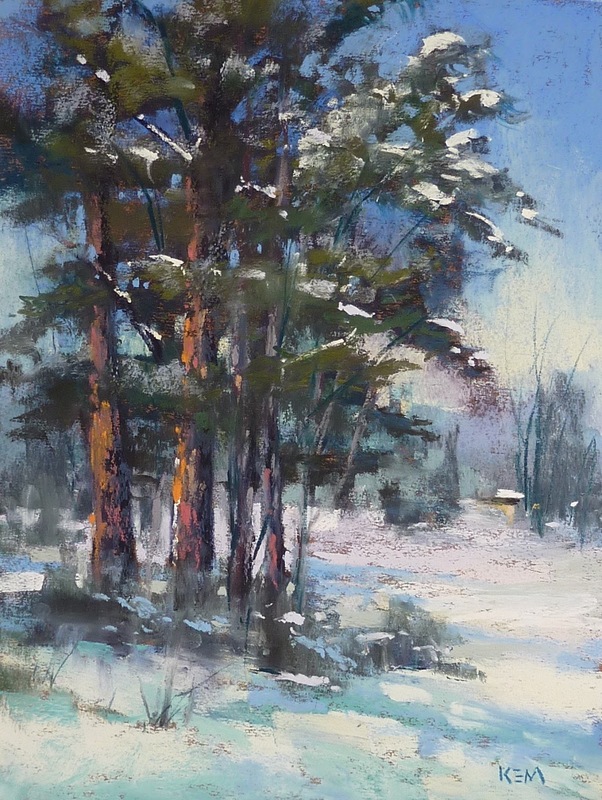 Finally I added snow to the branches and foliage with a soft whit Schmincke pastel. I decide to add the suggestion of a small building/shed to the background for balance. I noticed that little shed in the distance when I first looked at the finish. Wow. It really pops, it makes the whole scene unite. I thought, she must have put this in when she was putting those last highlights on the snow on the trees! Yep, you did. Beautiful. Thank you for this lesson. 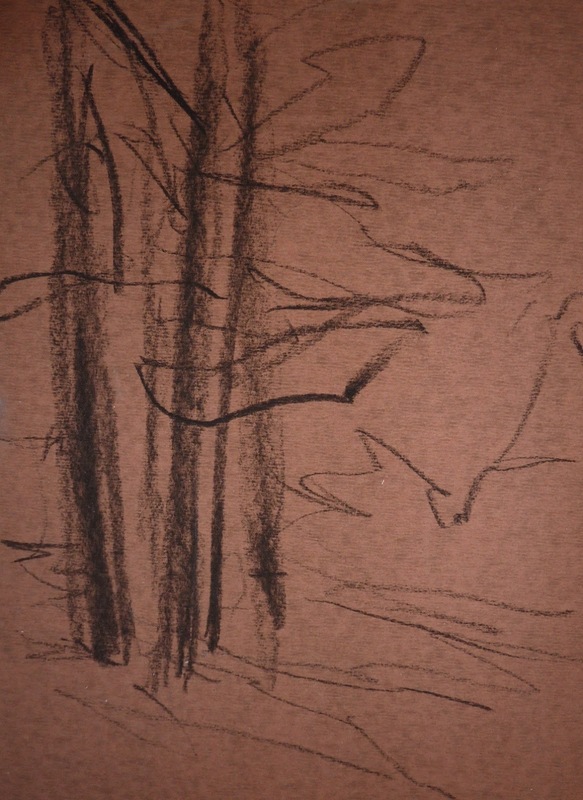 Today I sketched a pine and was struggling with rendering its branches and its solid, sturdy little needle-covered brushes - each twig was so heavily needled it looked like a circular brush. That kind of pine. Yet some branches were visible and the shape of the branches was visible. I got in a credible pencil rendering, but you've managed to capture the character of pine foliage as distinct from deciduous with these stages - and your masterful sky holes. This is beautiful. 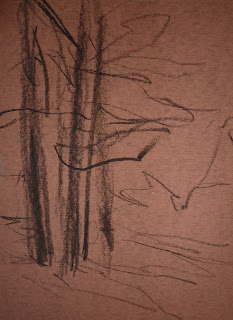 I think I need to do a number of more tree studies, both kinds, to start getting this right. Your colors are lush and wonderful, but it's that negative painting and working bold to tight in layers that I need to practice more often. And dare to get bold with. Your first sky holes were huge. You went back into some of them in the later detailing. I've got to remember I can do that.